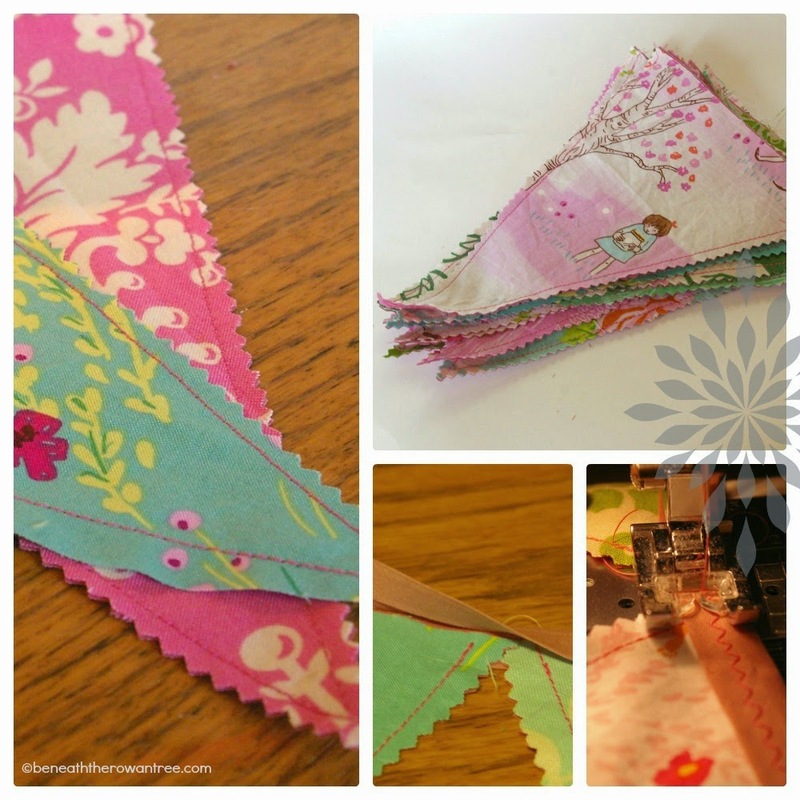 Here is a simple do-it-yourself tutorial for creating your own triangle pennant banner with scrap fabrics and basic sewing skills. Oh, and a little math (sorry!). 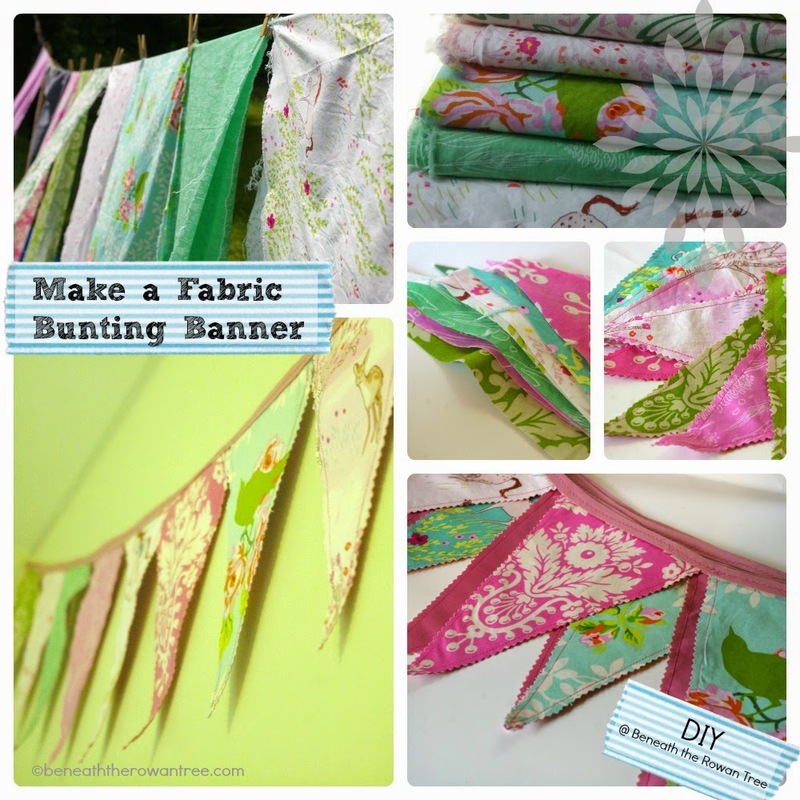 (bunting? banner? flags? 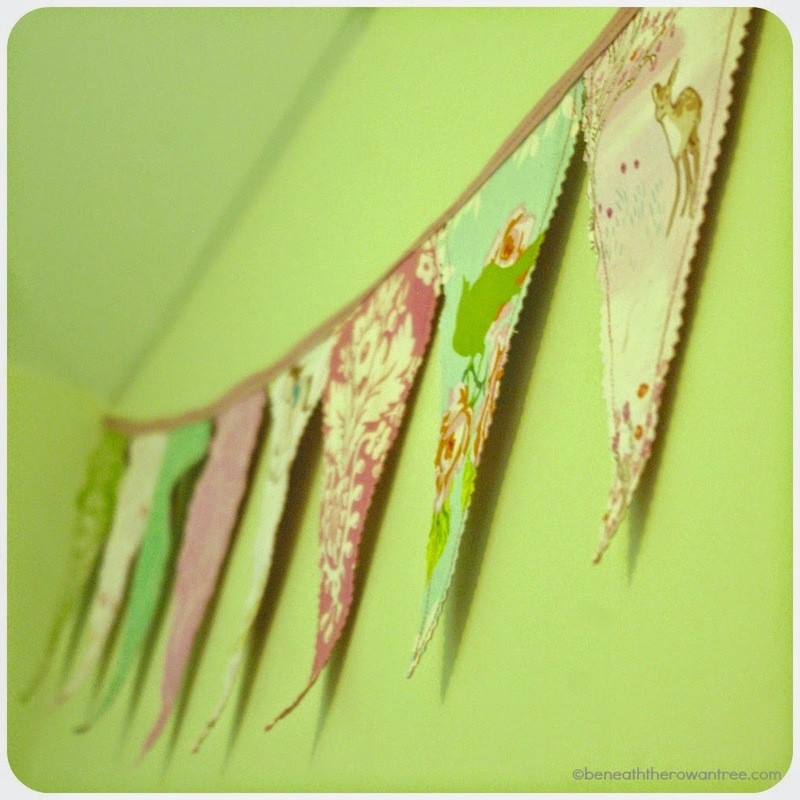 I like 'bunting', it makes me feel oh-so-Victorian). 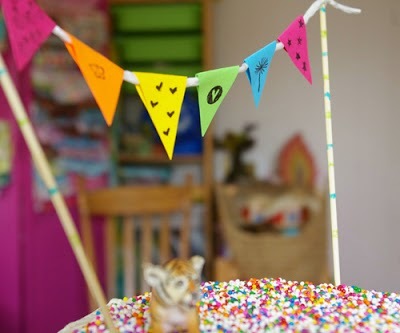 I made one for Rowan's cake three years ago~ that was the 'rainbow tiger' year (also known as the colossal rainbow cake wreck year). And I am still a fan. 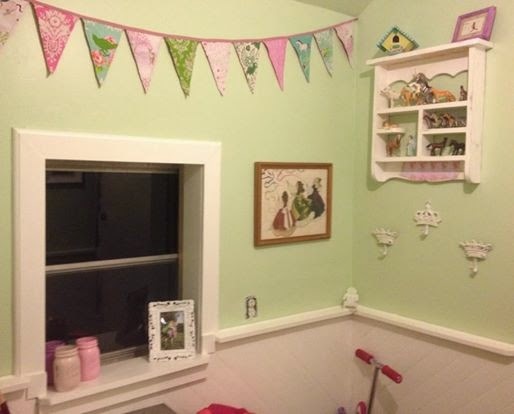 So a bunting seemed the perfect accessory for one of my mud room walls. Someone has suggested that it is a little too, well, too not mud-roomish to be called a mud room any more. But really, it is~ it is where we kick off our muddy shoes, drop the groceries and kick the garbage that needs to head out to the dump. It is a pretty practical room, even if it is pretty. And it is only pretty because it is one small space I have claimed that I have a single hope of 'finishing' in the midst of unpacking, renos, dogs, kids, homeschool, life and the fact that we are just not that tidy. My mud room makes me feel like 'at least I got THAT done'. but given that I accidentally dropped some gorgeous Sarah Jane Studios / Heather Bailey fabrics into my online shopping cart last week, when I was mistakenly looking at fabrics, that just coincidentally matched my mud room... this happened. And if I write it up as a tutorial, then I can totally live with myself and my unbroken no-more-craft-supplies pledge and hold my head up high. After trial and error with various methods of creating a banner, this is what I did. Figure out how long you need your banner to be when finished (mine was 90"). Figure out how large you want your triangles to be, accounting for losing a little off the edges if you pink them (I cut mine 6" x 9" for my high/ large space). I divided 90" by 6" flags (no space between them), which meant I needed 15 flags (30 pieces when you count the backing!) ~ this left me with no extra space at the ends, I would have a flag right to the edge on each side. 1. Draw a line the length of the TOP of your flags. 2. Mark the center of this line. 3. Use your ruler to measure from the center line, down to the length desired, mark this point. 4. Connect the triangle bits and take a moment to bask in the glow of your geometric prowess. 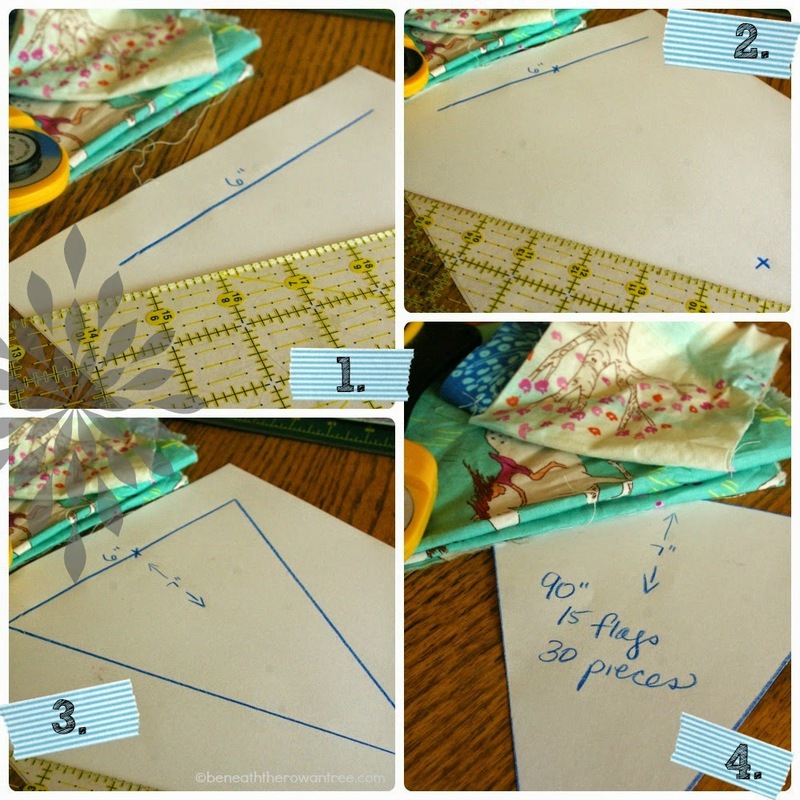 Cut out the triangle, this will be your template for making your flags and backing pieces. Cut out the number of flags you need AND the same number of backing pieces. 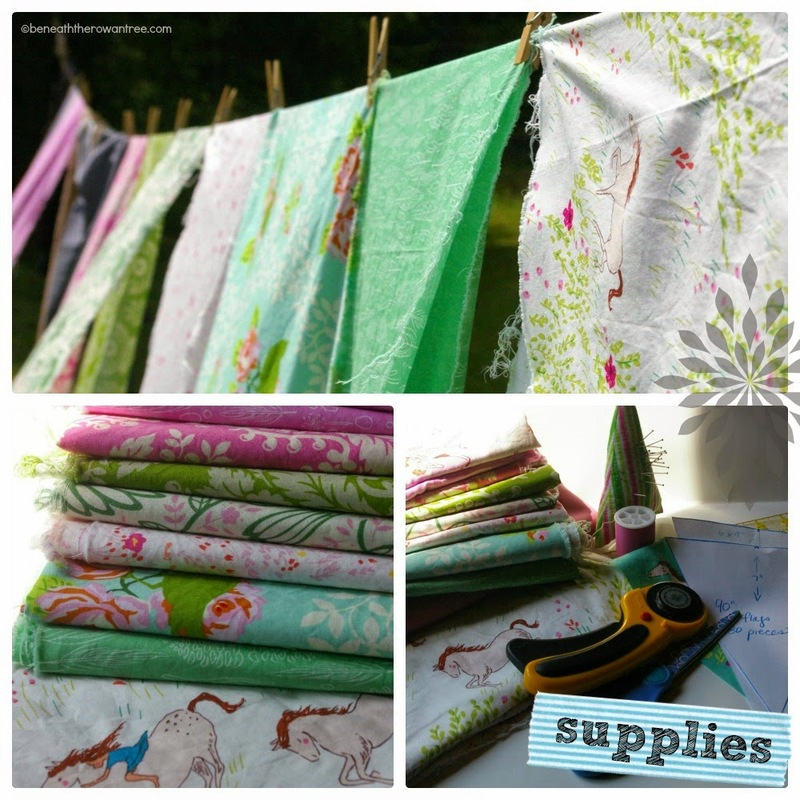 There are lots of neat tricks for making the most of your fabric when cutting triangles... if you know them, use them! If not, don't worry too much about grainline etc you can be pretty random and thrifty, just make sure any directional prints go the way you want them. 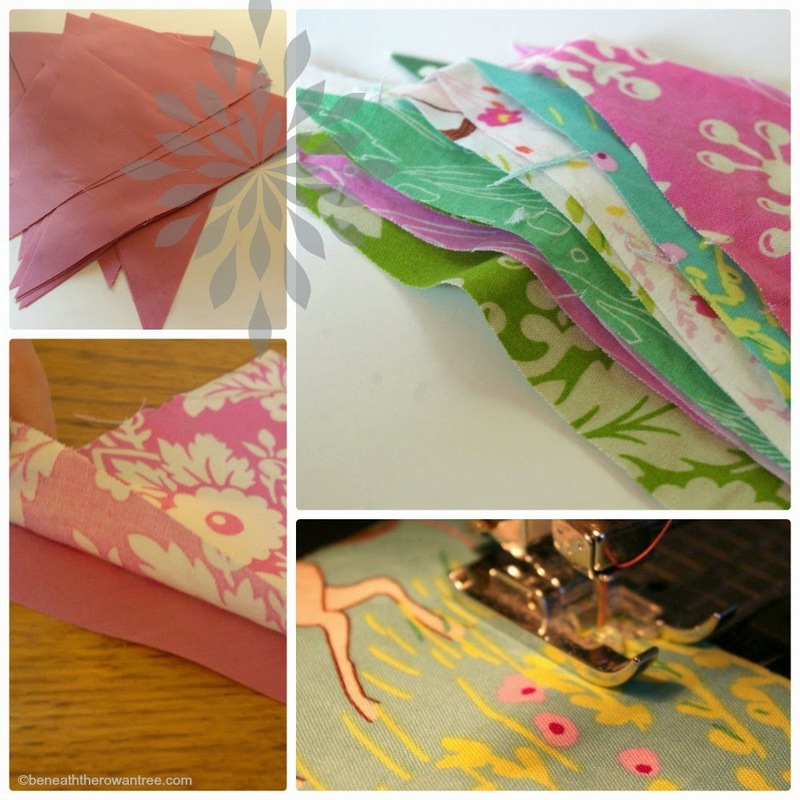 Sew each flag to its backing using a 1/4" seam allowance. If you plan to pink the edges, do it now. No need to pink the tops. Cut your double fold bias tape to the length needed for the finished banner, plus a couple of inches on each end for hanging. Place each flag into the middle of the bias tape (open it), tucking it into the fold and pin in place. Repeat for each flag, making sure they are evenly spaced as you go. Sew along the bias tape in the center. 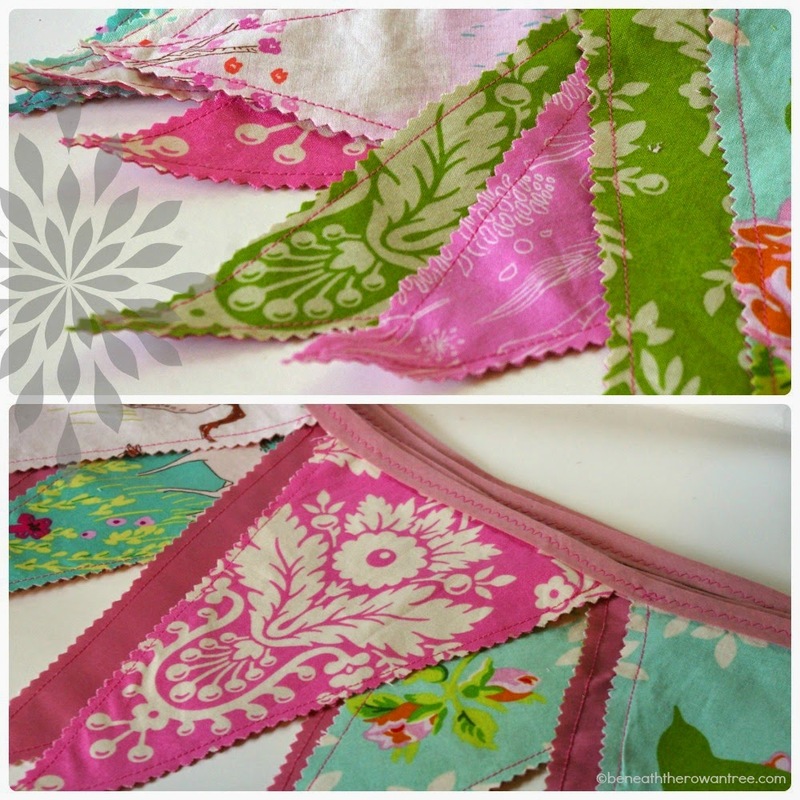 Using a wide zig-zag stitch will ensure you catch each flag securely. Press it all for a neat, smooth finish (and because my Grandmother taught me that everything is better when freshly pressed!). 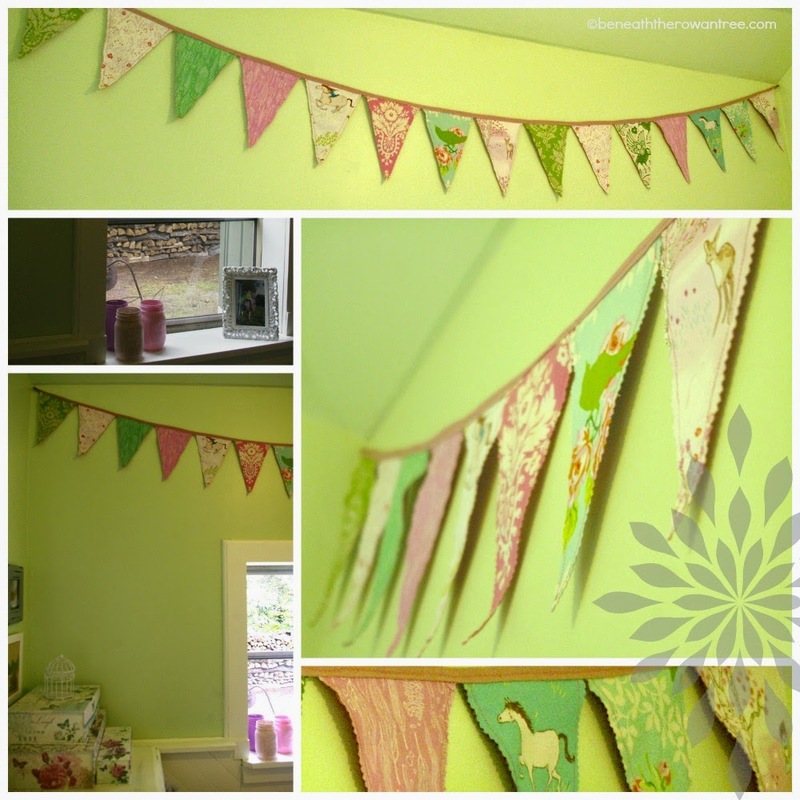 Hang your banner however you choose~ I folded over the bias tape at each end of the banner and made a loop with a couple of stitches, which I then hooked on a picture hanging hook in each corner of the room. 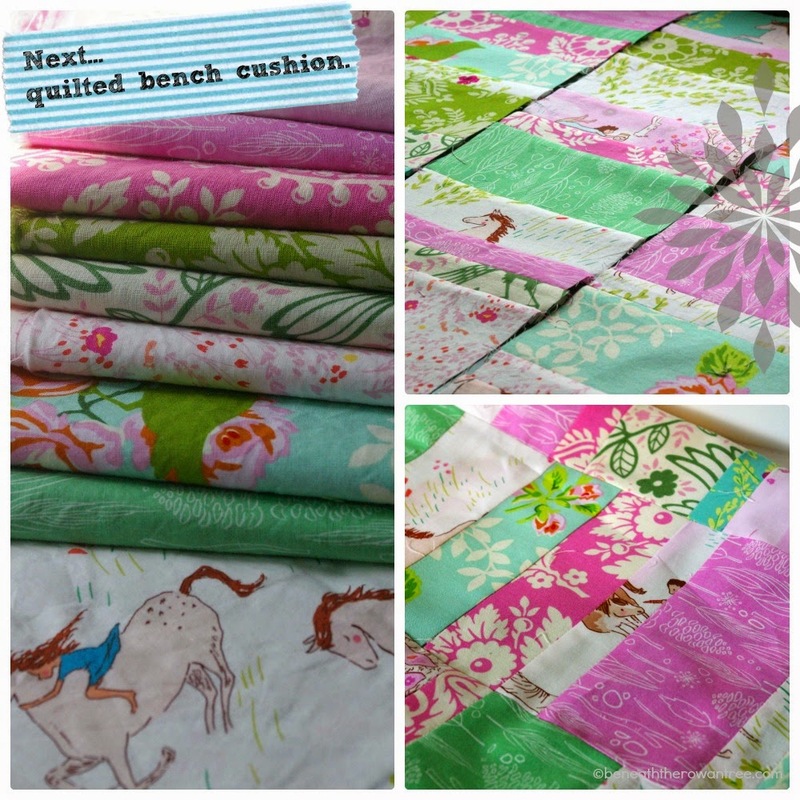 My next mud room project is to make a quilted cushion for the bench. Wow - no folding over and sewing seams - even I could do this - just need to buy some of those pinking shears.